40 years ago, in the hot and dry region of Wankie up near Zimbabwe’s Victoria Falls, it fell to me to shoot a lone elephant cow. Her trunk had been torn open by a snare and slowly dying she was going mad searching for water. I remember the look in her eye as she went down and a feeling of connection that I felt with her, and I remembered Dad’s words. Her spirit is a part of that history. 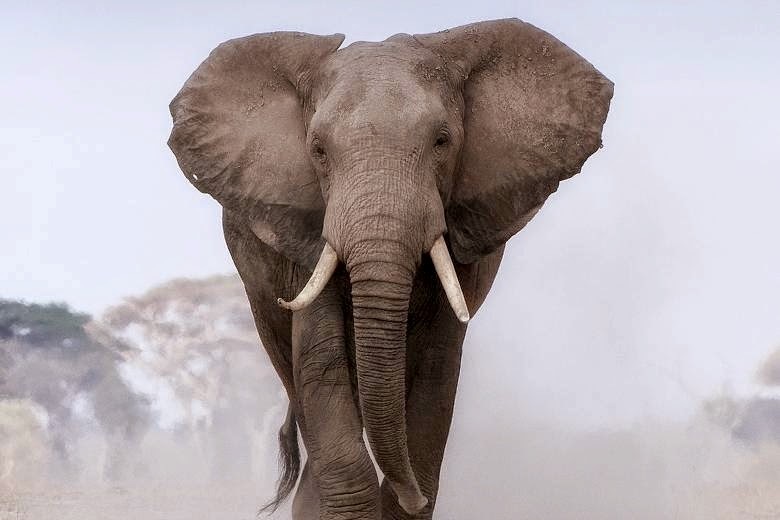 In August of this year National Geographic reported that between 2011 and now (2014) over 100 000 African elephants were killed by poachers, a record number. As an African the slow loss of these majestic animals is painful to me. Today, however, I know that the greatest threat they face is not parts of the world’s appetite for ivory, but something far more dangerous and difficult to stop. “… by 2080, much of South Africa’s famous Kruger National Park may be uninhabitable for the African elephant” writes Namuuya Sonile Sikanwe for the Times of Zambia. A respected researcher working in that country, Sikanwe says that climate change is already proving catastrophic with regards to the delicate biodiversity of the Zambezi Basin. Soon, she concludes, man and animal will come into conflict as extremes reduce crops, and the elephants come looking for food and water. at the University of Arizona, adds that traditional climate change theory is vastly understated. On our present course the earth's climate will change 10 times faster than during any other moment in the last 65 million years, and Southern Africa is warming. Increased CO2 emissions have been shown to actually fertilize certain types of plant growth, spelling a radical change in the vegetation that has supported elephants for thousands of years. It is predicted that savannahs and grasslands will become encroached by woodier vegetation. These plants will shift what water is available and spell disaster not only for elephants, but the entire natural eco-system. Today the world’s goal is to cap global warming at 2⁰C above pre industrial revolution levels. To do that the amount of greenhouse gasses released into the atmosphere (such as CO2) must be curtailed. Governments and big business are not working toward that target in a meaningful way. Quite literally, immediate comfort has become more important than the survival of life on this planet as we know it. If we want to save the elephant, and ourselves, we need to get involved. And it’s not hard at all. With only minor adjustment there are ways to re-shape the future of what we are building. Use energy efficient bulbs. A compact fluorescent bulb can save 150 lbs. of CO2 emission per year. In the same vein, turn appliances off when they’re not being used, lights in rooms that are empty, and switch appliances off at the source. Drive less. 1 lb. of CO2 is saved for each mile you don’t drive. How? Bike, create a lift club, move closer to work. Recycle. Recycling can save 2400 lbs. of CO2 emission per year. Check your tyres. Slightly flat tyres mean more fuel is used, which contributes to the great heating. When washing your hands use cold water instead of hot. Heating takes energy, and energy creation creates surplus CO2. Set your washing machine to 40⁰C, no higher. If you are doing all of that, I applaud you. By adjusting your lifestyle just a little you are making a difference. But don’t stop there, because there’s more that can be done. Buy less packaging by buying in bulk because packaging is useless, and takes energy to be produced. Divert your food waste to your garden because rotting food in landfills creates methane, which warms the atmosphere. Cook several meals in the oven at the same time, maximising energy use, and install solar heating in your home. Above all, let one minor change inspire you to the next. Read, discover what you can do. If we all do what we can a difference is being made. Energy reduction in one house is minuscule, in a neighbourhood it is profound, in a city it is a force. The Mickey Mouse days are over. 2014 is on course to be the hottest year on record. As shouts of ‘I want’ have became ‘I need’ we have made our little earth very ill. We can all sign a thousand petitions every day, pay in to a fund to employ one platoon per elephant herd to keep the bad men away and we’ll save not one in the long run. Water and that ton of food they need will simply not be there. We cannot forget the history of what we have built, we must not. We were reckless and in some ways we went too far. If we don’t fix this we’re all going down together and there will be no elephant with her wise eye, and no human to know the difference.